Coupons are one of the best ways to save on your grocery and household expenses, but they’re also a cause for overspending. It’s way too easy to see a “deal” that you just have to have (because you have a coupon for that item) and pick it up. Sometimes it doesn’t matter that you don’t really need the item or that your family doesn’t really like that brand of whatever the item has to be, you pick it up anyhow just to play the game of seeing how much savings you can cram onto one receipt. If you were honest with yourself, you might see that this has happened to you more than once. There’s a very quick fix for issues like this, though. Learning what not to do with your coupons will help you not only save money, but will make sure you’re not wasting money. STOP shopping with your coupons in hand. When you shop with your coupon binder or box, you set yourself up to spend extra money that you didn’t plan on spending. It becomes too easy to spend that extra money when you don’t want to or need to. Shopping without your coupons is actually pretty freeing. You aren’t spending a ton of time in the store eyeballing the products trying to find that jaw dropping deal. Instead of carrying your binder with you, plan your shopping list at home and take only the coupons that you need. Yes, you might miss out on a “deal” or two, but if you needed that deal to begin with it would already be on your list. If you’ve got a coupon or two that you want to check the price of an item on, take those individual coupons with you. By not taking the whole shebang with you when you shop, you’re not going to be tempted to spend more money than you originally planned. This tactic, while it seems counter-intuitive, can actually cut your grocery bill even further than what you’re seeing with the constant use of coupons. Plus, you’ll save time in the store and you won’t even miss those “deals” you’re not grabbing. Give it a shot and I think you’ll like what you see! 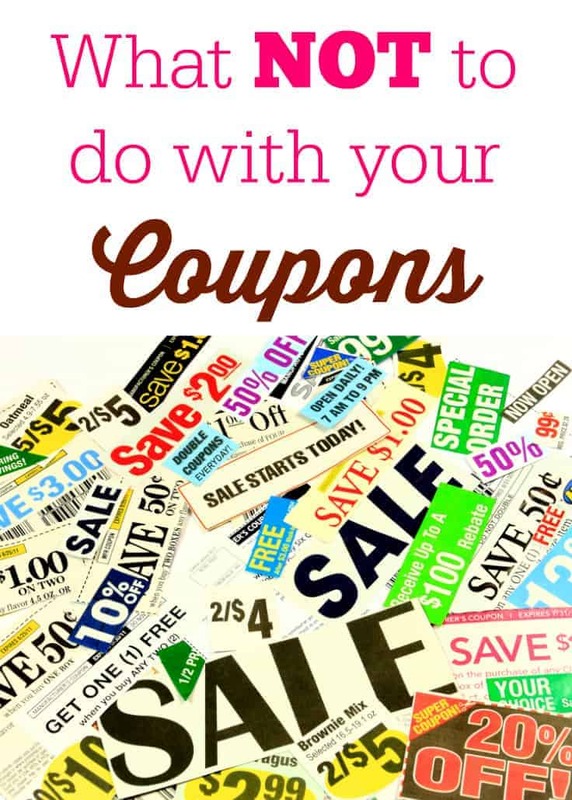 Do you carry all your coupons with you when you shop? I try to highlight anything on my shopping list that I have a coupon for, and then paperclip them to my list before going into the store.